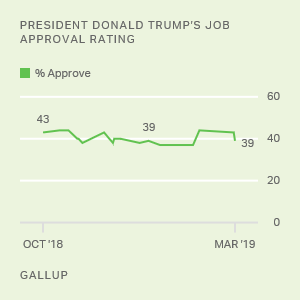 WASHINGTON, D.C. -- Congress' 26% job approval rating is the highest it has been in over two years. 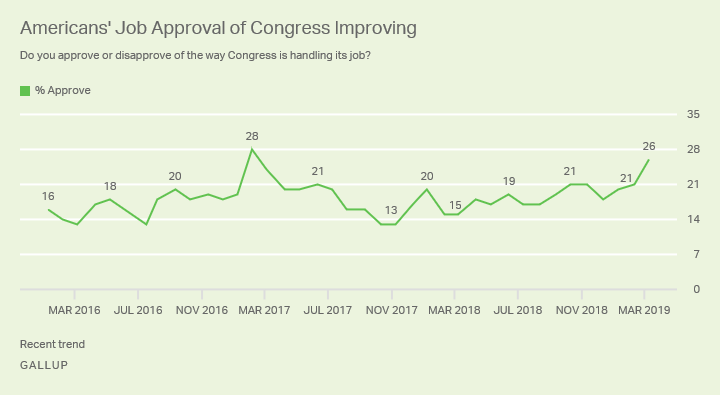 Congress last had a higher reading -- 28% approval -- in February 2017, shortly after Donald Trump became president and began working with Republican majorities in both houses of Congress. Congress' ratings have typically not been stellar, averaging 30% since 1974. The full trend can be found here. Democrats are more likely than Republicans to approve of the job Congress is doing, 30% to 18%. Since December, prior to the Democratic Party becoming the majority party in the House, Democrats' approval of Congress has surged and Republicans' has declined slightly. Thus, while neither party group is highly satisfied with the job Congress is doing, it has increasingly come to be viewed as a Democratic institution since the new Congress took office in January. 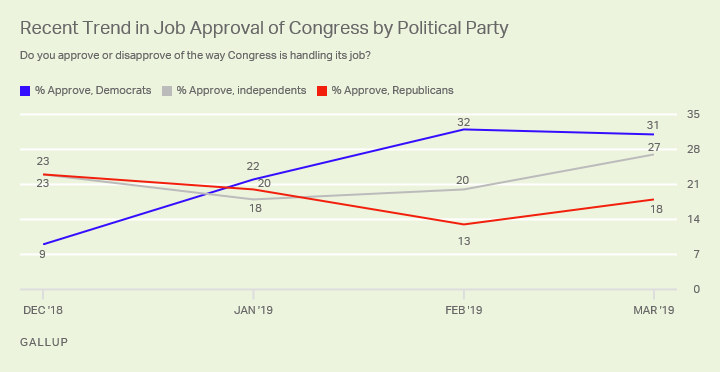 Independents' opinions about Congress are now slightly more positive than they were in December, but they have improved more substantially since dipping in January during the partial federal government shutdown. While the survey was in the field, Congress considered measures to halt President Trump's attempt to divert federal monies to build a wall on the U.S.-Mexico border by declaring the situation there a national emergency. Enough Republican senators voted with their Democratic colleagues to pass the measure, but not enough where Congress will be able to override the veto of the measure Trump issued last week. It is unclear to what extent that mixed outcome affected party groups' approval of Congress since the last survey, including modest increases among independents and Republicans and no change among Democrats. Since taking office, Rep. Alexandra Ocasio-Cortez has become better known, with a 7-point increase to 31% in her favorable rating and a 15-point increase in her unfavorable rating to 41%.